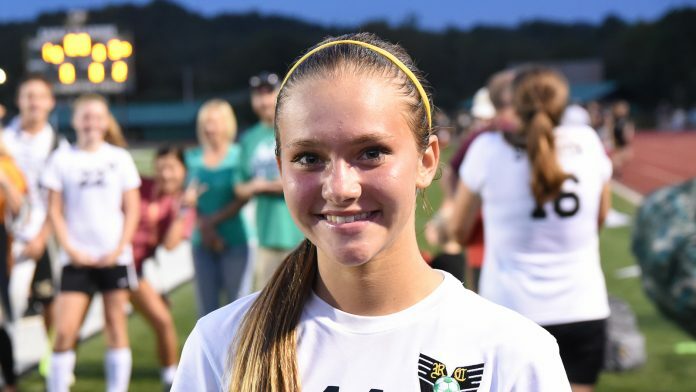 Evensville, TN — Rhea County Lady Eagle Soccer player Hannah Deakins scored 3 second half goals as Lady Eagles come from down 1-0 at halt time to win 3-1. Deakins and her team mates spent most of the second half knocking on Hixson’s door and it was Deakins who opened the door and delivered 3 nice goals for the Lady Eagles. The Rhea County defense kept the ball away from their goals and Kanipes had an easy second half with very few shots on goal by Hixson. Midfielders did great job pressuring the ball up top. Allison Sekura was also active offensively, but could not get the ball into the net. Several players played well, including Kimmine Stumbo, Whitney Gross and Tori Mitchell. Rhea County travels to Polk County on Thursday for 6;00 pm start.